Yamaha Motor models to be displayed at the 40th Tokyo Motor Show 2007 (Part 2) - News Releases | Yamaha Motor Co., Ltd.
Yamaha Motor Co., Ltd. is proud to announce that it will be displaying 19 exhibition models in a booth organized around the concept of "The Art of Engineering" at the upcoming 40th Tokyo Motor Show 2007 to be held over the 16 days from Oct. 27 (Sat.) to Nov. 11 (Sun.) (Organizer: Japan Automobile Manufacturers Association; Venue: Makuhari Messe, Chiba Pref. ; Special invitation day: Oct. 26). Introduced here are outlines of 6 special exhibition models in the fuel cell and electric powered vehicle categories. This is a hybrid 4-wheeled vehicle powered by a combination of a liquid-cooled V-twin gasoline engine and an electric motor. 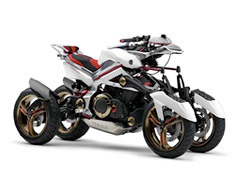 It is also designed with a unique dual-scythe suspension that enables cornering with a lean (banking) like a motorcycle despite the 4-wheel format. There is also a dual arm-lock system that keeps the machine upright when at rest without a stand. It offers excellent performance and maneuverability with a machine width roughly equivalent to that of a 2-wheeler. 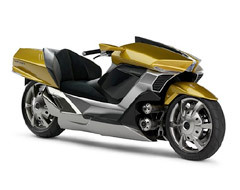 This is a hybrid type motorcycle with a gasoline engine and an electric motor that function in parallel, with the electric motor kicking in during acceleration to assist the engine and switching over when cruising to perform a electricity generating function that re-charges the battery. The engine-brake force created during deceleration is also used to generate electricity to charge the battery. 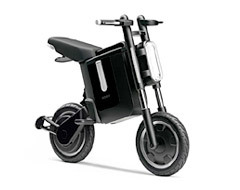 Yamaha's super-thin YIPU (Yamaha Intelligent Power Unit) is built into the rear hub to provide the electric power assist during acceleration and when wheeling the vehicle by hand, and it also provides a reverse function. In a collaboration with Yamaha Corp. (music) this model also mounts a special audio system. 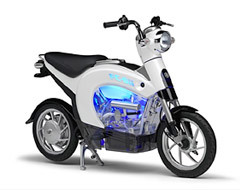 This model is a further evolution of the "FC-me" fuel cell motorcycle using a methanol-water solution as fuel, unveiled in Sept. 2005 with significant performance improvements. This new version is enhanced with new features including: (1) a Yamaha-exclusive compact cell stack that features the highest level of power density in the 1kW class, (2) a detachable lithium-ion battery for easy recharging, (3) modular design components, readily available parts and improved serviceability aimed at achieving practical use and (4) a fuel cell system which achieves a top-level performance of 30% system efficiency for a DMFC (Direct Methanol Fuel Cell) system. The development of this model has been assisted with some funding from the New Energy and Industrial Technology Development Organization (NEDO). This is an electric commuter vehicle with collapsible seat, fold-in rear wheel, handlebars and footrests for compact, convenient storage. For owners of a cell phone with the FeliCa* function, the main power switch can be turned on and off simply holding up your cell phone to the switch. The bike is also equipped to access a variety of Internet services. * FeliCa (registered trademark) is a non-contact IC card technology developed by SONY Corp. 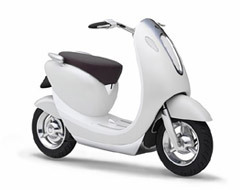 This is a convenient "minimum electric commuter" bike with a light weight, compact body with a helmet storage space. This is a fuel cell motorcycle mounting the "Yamaha Hydrogen Fuel Cell System" fueled by compressed hydrogen gas from a tank with a capacity of 35MPa. By adopting a hybrid system mounting a secondary rechargeable battery and metal separators in the fuel cells, it has been possible to achieve a compact lightweight design. 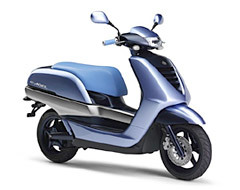 The adoption of Yamaha's super-thin YIPU (Yamaha Integrated Power Unit) also improves environmental performance and increases ease of use as a commuter bike.